A beautiful, rich and sensuous historical novel, John Saturnall's Feast tells the story of a young orphan who becomes a kitchen boy at a manor house, and rises through the ranks to become the greatest Cook of his generation. It is a story of food, star-crossed lovers, ancient myths and one boy's rise from outcast to hero. Orphaned when his mother dies of starvation, having been cast out of her village as a witch, John is taken in at the kitchens at Buckland Manor, where he quickly rises from kitchen-boy to Cook, and is known for his uniquely keen palate and natural cooking ability. However, he quickly gets on the wrong side of Lady Lucretia, the aristocratic daughter of the Lord of the Manor. In order to inherit the estate, Lucretia must wed, but her fiance is an arrogant buffoon. When Lucretia takes on a vow of hunger until her father calls off her engagement to her insipid husband-to-be, it falls to John to try to cook her delicious foods that might tempt her to break her fast. 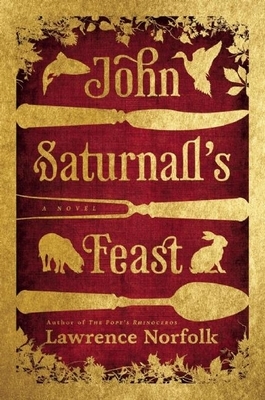 Reminiscent of Wolf Hall and Jonathan Strange & Mr. Norrell, John Saturnall's Feast is a brilliant work and a delight for all the senses. Lawrence Norfolk is the author of the critically acclaimed novels Lempriere's Dictionary, The Pope's Rhinoceros, and In the Shape of a Boar. He lives in London.